Farmgirl Fare: Daily Farm Photo 7/21/06: And Sheeeeeeee's SAFE! Daily Farm Photo 7/21/06: And Sheeeeeeee's SAFE! It's not exactly dignified, but it works. There's still a lot of storm damage to deal with around the farm, but we definitely made some progress yesterday. The large chunk of barn roof that blew off has been nailed back down, the top of the chimney is no longer laying on the lawn, a fair amount of the 2006 onion crop that had been drying out in the greenhouse was re-dried and salvaged, and, most importantly, Lindy The Chicken is back at home with Whitey. Yesterday morning I crouched down on the ground in the yard, aimed a giant spotlight under The Shack, and spotted Lindy—about 15 feet in, totally unreachable, but blinking her beady little eyes. Alive! I checked on her throughout the day, and the only thing she appeared to move was her head, but she looked okay, and I didn't think the dogs could fit under that particular section of the house. I racked my brain to figure out a way to rescue her, but Joe (who has much more chicken catching experience than I do) said we would just have to wait until she came out on her own. I was doubtful. But around 8 o'clock last night, I got back down on the ground, aimed my spotlight under The Shack, and didn't see a chicken. I circled around The Shack, crouching and looking in various spots, and still I couldn't find her. I walked back into the house, announced that she was gone, and then practically scared Joe to death as I glanced out the window and shrieked, "THERE SHE IS! SHE'S ON THE DRIVEWAY!" He grabbed the fishing/chicken-catching net, I grabbed my camera, and we quietly sneaked outside so as not to alert the dogs. There she was, ambling down the road as only a chicken can amble, paying no attention to all of the sheep milling about her. Our view was mainly blocked by the giant fallen tree in front of the yard, so Joe went one way, and I went the other, tiptoeing gingerly through the tall grass in totally inappropriate shoes and not nearly enough protective clothing. A few scuffles, some muffled laughter later (there is nothing quite as amusing to me as the sight of a chicken who is jogging), and then whap! she was in the net. Joe scooped her up while I fumbled with the camera and tried not to trip over the rocks in the creekbed. I slip-slided after the two of them, Joe hurrying as fast as he could toward the coop, Lindy swinging in the net beside him, and me yelling "Stop! Stop! I can't get a good picture!" But they didn't slow down. Not until Joe had Lindy safely back in her henhouse did he turn to me and calmly explain, "I've had them escape from the net before. No way was I going to stop." Lindy the Chicken, back where she belongs. Phew. What a relief. As we walked back to the house I said, "I'm sure Whitey is happier now, too. Poor thing, when I caught her up this morning she looked so pitiful, soaking wet and muddy and missing all those feathers. She wouldn't even come out of the coop when I checked on her later. It was awful." "Oh no," said Joe. "She came out. Dan went over to see how she was doing. He munched on some weeds around her run so they'd have better airflow, and she popped out and said 'hello.'" "Are you making this up?" "No! It was a Kodak moment. You missed it." I can only imagine what else I miss around here—because half of the stuff I do see is pretty unbelievable. Thanks so much for all of your kind words and bolstering comments. I'm just happy that Lindy and Whitey are safe. It's bad enough if a dog gets any chicken. It's something else entirely when that chicken has friends and fans around the world. So now that you've been updated, baby Cary and I need to leave the comfort of our tiny air-conditioned office and head out into the oppressive heat (looks like it's going to be another record breaker like yesterday) to help restore my poor blown apart greenhouse to its previous splendor, supervise some serious chainsawing work, and prepare for tonight's storm that's supposed to hit. Meanwhile, 470,000 homes in the greater St. Louis area are still without power from the same storm that hit our farm Wednesday night. I knew it could have been a lot worse. Want to read a little more about life on the farm? Yea! All's well that ends well! It would appear that you got some pretty good Kodak shots, after all. Glad to hear Lindy's alright, and Whitey's happy again. Thanks for the update! We know you are busy, but now we are all very relieved to hear that Lindy is back in her hen house. Im glad you are all safe! It must have been some storm to cause all that damage. I will keep my fingers crossed that the next storm passes you by. Thanks for taking the time to catch us up on the hectic events. Yea for Lindy! We have ducks and geese...I scare my husband once a month or so by screaming "Oh, my God!" and running from the house. Apparently, you're supposed to announce why you're screaming (the duck came back...yippee!!) instead of just exclaiming and acting. Happy, healthy birds-always a good thing. I came early this morning to see if you had posted on the blog yet. I was on the edge of my seat wondering if Lindy would be found. Poor, poor dear. She must have been frightened half to death! You're right, the pic of her having a bad feather day really would horrify her if she knew it was plastered all over the blog world, but it is still a Kodak moment! You have a wonderful positive attitude. Good luck! 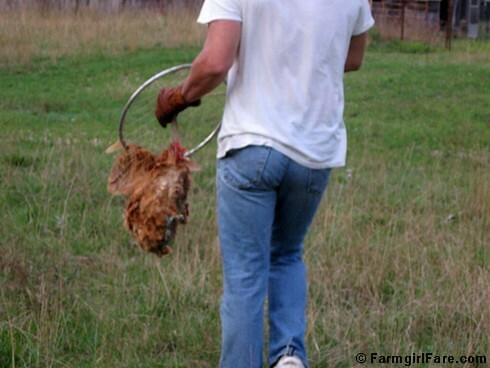 I love chickens, but catching them is a challenge. Here in these parts, you can find ads in the paper for "Chicken Catchers" that pay five something an hour. I guess that would be a workout. Oh, Lindy (the Chicken)....first, we are indeed glad you are safe. Do you have any idea how worried we were? That being said, you may want to peck through FG Susan's site when she's out doing chores - this picture of you in a...a..common fish net?? Unflattering is an understatement. What will al the other chickenz say when they see this? If no one else will say it, I will. Phew! Thank God! And what a cute story! 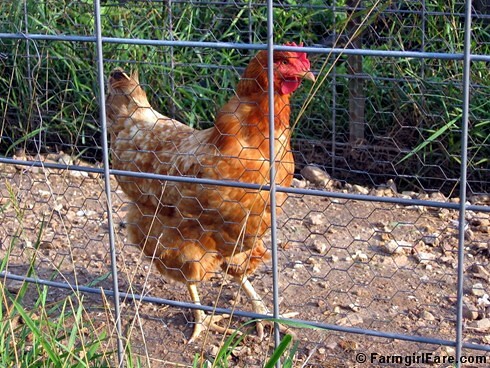 i can imagine the funny sight of a hen swinging in the net. not so comfortable or flattering. this is probably why i've never seen a chicken in a hammock. oh my goodness, so glad all is well! I missed the last post until today, how harrowing! That had to be some storm. I was so worried about Lindy. I was afraid to click on your blog this morning for fear of what I would find. Well. Hmmmpf. Was it really necessary to show me in the bag, as it were? Whitey and I are smoothing our feathers, but otherwise fine. Naturally, we are being a big help to Susan in the cleanup. We offer many helpful suggestions. What would she do without the poultry? Thank you for all your kind thoughts, fans. Just so it's clear, it wasn't that I panicked. I was just making sure the coast was clear, is all. PS Whoops, no intention to be anonymous. (ever) I guess maybe I was just a teeny bit rattled. What's wrong here? This is from lindy the chicken, for heaven's sake. I AGREE with Tana! Nice view! At least the chicken's head is upright. I get upset when they get hung upside down, like dead chicken walking! So undignified! My house full of dogs were all rooting for Lindy! Great News! I told people at work today about the missing Lindy. They will be so happy on Monday. I had an image of little chicken legs sticking out from under your house a la Wizard of Oz! Hope the storms aren't too bad tonight and you get a lot of repairs done this weekend. The weather has been so severe this spring and summer. I think maybe Lindy had the right idea! Me thinks that not only are you and that Lindy chick clever, but you have some clever posters. And when is that book coming out??? as i saw that storm on radar moving the wrong way and heading your direction i hoped you and your farm would fare safe. it petered out before it could make it to us. we need the rain but not that badly. i'm glad all is well. Ahem - yeah, Tana - you got that right. And I have been wondering (tho new here) just what this best of all men looked like...at least we have a good idea what keeps her "down on the farm". Hot damn. LOL AND he can catch chickens? KEEPER! Are you girls hitting on Joe? Susan might decide not to blog to protect her property..in more than one way. I bet the feathers would really be flying! Kewlies! Looking forward to seeing the farm again when things are under control from the storms. tell ya what, you send those storms here.. we could use the excitement -- well except for the power outages. And we could use the rain.... semi desert conditions are normal but this is crazy! Hey Jeff-haven't there been enough indignities associated with this event? Anyhow, chickenz don't have butts, per say. We have, like, tailfeathers. y'know. Glad all the chichens are home where they belong, maybe you need to import some beavers to help with the tree removal. Seriously, I hope you all recover soon, I know how the aftermath of storms can be having survived Isabel. It's a long slow cleanup. Jeff is sure to be appointed The Poultry Laureate! Daily Farm Photo 7/17/06: Knock, Knock!